The Osaki OS-7200CR is one of the newest releases from Osaki. It is the top model of the 7200 series and has foot rollers, a new and improved sound system, and upgraded synthetic leather. The OS-7200CR is one of the best all around massage chairs on the market today! Throughout the chair, 51 airbags inflate and deflate to stimulate and boost healthy circulation. Unique to the OS-7200CR is the Chromo-therapy feature, in which blue LED lights create a soothing ambiance when in a dark room. In combination with Zero Gravity, 170 degree recline, iPod attachment, computer body scanner and full range of massage functions, this chair is certain to be your lifelong partner in massage therapy. The below listed massage techniques all function simultaneously and in combination with one another to deliver therapeutic effects for your whole body. Introduced by NASA more than 2 decades ago, the zero gravity position is a relaxing and stress-free position on your body, minimizing the pressure along the back and sine region. The zero gravity feature of the Osaki OS-7200CR is allows you to enjoy both the comfort and benefits of massage. The massage track is designed to contour the human back more than ever and enhance the movement of the massage heads with better accuracy. You have approximately 350 accupoints in your body, with nearly 100 in your back and neck alone. 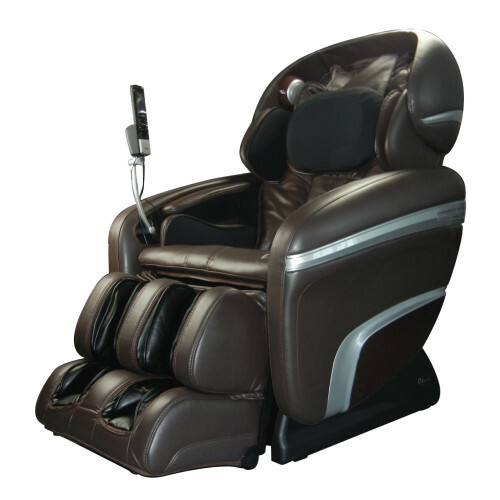 From the soothing palm style massage of the Swedish massage, to the deep tissue kneading and the shiatsu style massage, the OS-7200CR zero gravity massage chair has a variety of techniques to target the acupoints with incredible accuracy. The 3D point navigation system using pressure sensors technology virtually maps your back (up to 200 sq. inches) for ultimate massage accuracy and efficiency. The 3D Zero Gravity system scans your back and delivers a massage that contours the unique spine curve of each individual user of the chair. The “floating” massage heads glide over your back knowing where to massage and where not to. Add to your massage pleasure by playing your favorite music with a built in mp3 connection. The music is delivered through speakers mounted at head level along the side of the backrest. In the seat and hips are 6 airbags that inflate to squeeze the hips inwards. The soft air stimulation also works on the thighs by stretching the muscles. The action of the intensive massage with heating for the lower back and air massage for the buttocks make for a more thorough and enjoyable massage. Inflating the airbag in the seat positions your lower back in the optimal position to recieve a stronger and deeper massage.